The Kansas Budget: Time to Foreclose on the "Fiscal Experiment"
Time to Foreclose on the "Fiscal Experiment"
Will the bankers give you a loan? Not without a lot more information. Not without a business plan that shows calculations of how your idea might reasonably work. 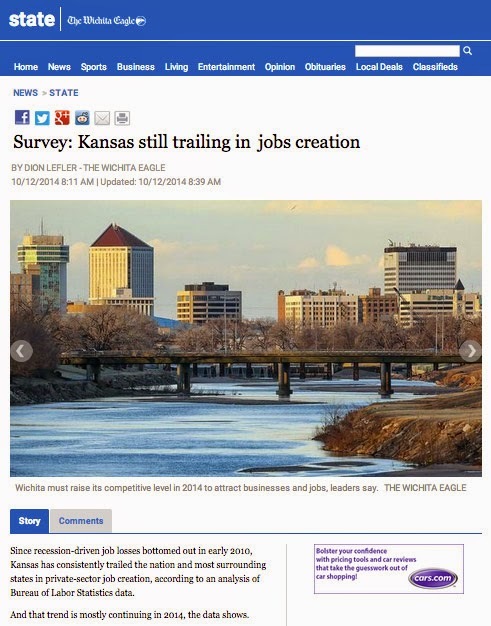 Yet in Kansas we have embarked on a far-reaching fiscal experiment without any kind of hard-nosed business plan that calculates how it might function or how it will impact the state budget. If income tax rates are cut, how will that revenue be replaced? With sales tax receipts? With property tax increases? If new jobs must be created to replace the revenue, how many new jobs will it take? And by when must those jobs be created? Will education and other state services be affected? We have no plan that even pretends to show how the experiment might succeed. No spreadsheet that outlines details. No timeline. No metrics for what would constitute success or failure. Rather, we simply have a promise that something grand will happen, and state revenue will almost magically replenish. Revenue fell $688 million in fiscal year 2014. In the first three months of FY 2015, revenue has continued to go lower. The state’s savings account has been emptied out to pay for the growing imbalance between revenue and expenses. Kansas faces a financial crisis that imperils education and other vital services. So now the promise has changed to: Just wait long enough, and something grand will happen. How? The governor says he will create 100,000 jobs over the next four years, but provides no details. Even if that much job growth were realistic and could actually occur, would that fix the budget? Let's see. Imagine 100,000 new jobs each paying a $50,000 salary (about $25 an hour). If the holder of each job paid $1,500 in state income tax, the revenue would eventually total $150 million each year. Eventually. However, the imbalance in the state budget is far greater than that right now and is growing. Notably, the Kansas Policy Institute, an organization outside state government but with close ties to the governor, gives us a look at the consequences of the fiscal experiment by modeling a five-year budget plan. Their plan proposes state cuts to education and other programs, and a giant raid on the Highway Fund. It’s all about pulling in, cutting back, downsizing, and making do with less. The plan provides no hope for investing, improving, or taking Kansas education into the future. In round one, a fiscal experiment was begun without any hard numbers on how things might work, and it failed. Now the governor wants to go on to round two, and there are still no hard numbers showing how it's supposed to work. Kansans, it's time to foreclose on the experiment. Don’t wait for it to get even worse. Revenue Down! What Does It Mean?